The Rotator Cuff is the most common source of shoulder pain, weakness and dysfunction. While the Rotator Cuff can be injured in a fall, a motor vehicle accident or by other trauma, most of the time the Rotator Cuff becomes damaged there is no trauma involved, and a cause is never found. This is because the Rotator Cuff most often becomes injured simply by normal wear and tear, especially if overuse is involved. While older individuals are most commonly affected, young athletes and workers who overuse their shoulder are also susceptible to Rotator Cuff problems. In fact, Rotator Cuff injuries are so common that they could almost be considered part of the human condition. Rotator Cuff problems happen to all kinds of people, most of whom aren’t even sure how it happened. Rotator Cuff pain can be felt on the front, back or outside of the shoulder. It is usually also felt on the outside of the upper arm and may even be “referred” down to the elbow, or sometimes as far down as the wrist. Rotator Cuff pain is usually worse at night, when lifting the arm, with sudden motion and when putting the arm behind the back (as when putting a hand into a back pocket, fastening a bra or reaching into the back seat of a car). The shoulder is a ball and socket joint, which is designed to provide great mobility. The two muscles that lift the arm are the deltoid, the big muscle that goes over the top of the shoulder, and the Rotator Cuff, which is the merger of four tendons that surround the shoulder. If the deltoid muscle acted alone, every time the arm was raised, the deltoid would pull the humeral head up into the acromion (the bone on top of the shoulder that the deltoid is attached to). Instead of the arm elevating, the shoulder would just shrug. It is the Rotator Cuff’s job to stabilize the ball in the socket so that this doesn’t happen. The Rotator Cuff keeps the shoulder’s ball centered in its socket like a golf ball balanced on a tee. With the humeral head (the ball) centered in the glenoid socket, the deltoid can elevate the arm. The Rotator Cuff keeps the ball centered by pressing it into the socket so that it can’t slide up. Many Rotator Cuff problems occur because the Rotator Cuff is a relatively small muscle-tendon unit, and the deltoid is a lot bigger and stronger. We tend to preferentially use the big muscles of our body and allow our smaller muscles, such as the Rotator Cuff, to weaken. In addition, the Rotator Cuff has a relatively poor blood supply and may not get enough oxygen to repair itself when over-used or damaged. For these reasons, the deltoid muscle maintains its strength better with aging and overuse. So if the Rotator Cuff isn’t taken care of, it degenerates and becomes weak, predisposing it to becoming damaged. Physicians used to think that the problem was Rotator Cuff ‘Tendinitis’, which means inflammation of the Rotator Cuff. However, since shoulder surgeons started looking at injured Rotator Cuff Tendons under the microscope we now know that this is not correct. What really happens is that the Rotator Cuff degenerates, without inflammation. The technical name for this degeneration is Rotator Cuff ‘Tendinosis’. Tendinosis tissue is painful in and of itself. Older physicians may use the term ‘bursitis’, but this term is extremely inaccurate. 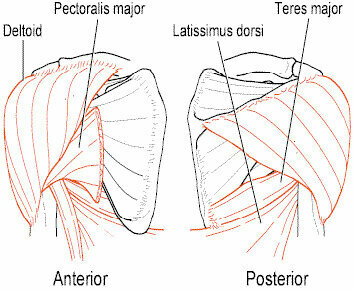 Rotator Cuff Tendinosis is most commonly an overuse injury. Overuse occurs when repetitive activity leads to tissue damage quicker than the body can heal it. Over time, repetitive trauma eventually leads to chronic tissue breakdown (tendinosis) and pain. As the Rotator Cuff gets damaged it also becomes weaker. And as the Rotator Cuff becomes weaker it is less able to hold the humeral head down in the glenoid socket where it belongs. So when the arm is raised up in the presence of a weak Rotator Cuff, the humeral head gets pulled abnormally high by the large deltoid muscle. And as the humeral head rides high, the Rotator Cuff attached to the top of it contacts the bony acromion above it. This contact may further damage the Rotator Cuff, which further weakens it, and so on in a vicious cycle. If the wear and tear goes on long enough the Rotator Cuff degeneration (tendinosis) progresses to a full-thickness Rotator Cuff Tear. Rotator Cuff Tears are a more advanced or chronic problem. In addition to pain, Rotator Cuff Tears are often associated with weakness. Young people with Rotator Cuff problems may have underlying shoulder instability. Even if the shoulder has never dislocated (come out of the socket), the chronic stresses of overhead athletics or work can lead to ligament stretching / damage, which causes subtle shoulder instability. Once subtle shoulder instability is present, the Rotator Cuff has to work even harder to keep the humeral head centered in its socket. This predisposes to overuse injuries of the Rotator Cuff, degenerative tendinosis, pain, weakness and dysfunction. There is a balance between the stresses applied to a shoulder and the Rotator Cuff’s strength that is used to absorb these applied stresses. When the stress applied exceeds what the Rotator Cuff has the strength to absorb, tissue damage occurs. To treat mild or moderate Rotator Cuff damage, either lower the stress or increase the Rotator Cuff’s strength so that it is able to absorb the applied stresses. For example, if a shoulder hurts every time its arm is raised, pain can be avoided by not raising the arm up. If arm elevation is avoided for long enough the shoulder may not hurt so much. 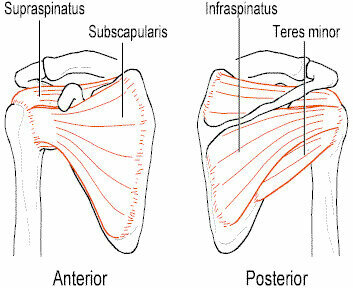 The problem is that the shoulder has a distinct “use it or lose it” quality, and avoiding arm elevation can lead to permanent shoulder stiffness. The better treatment is to increase the strength and endurance of the Rotator Cuff and shoulder blade muscles. This cures most cases of shoulder pain. In many cases these specialized strengthening exercises are all that is necessary to cure the Rotator Cuff Tendinosis, especially if the problem is caught early. These exercises are taught by a therapist and performed using elastic resistance (big rubber bands, such as an Isotube), which work better than dumbbell weights. A steroid injection into the shoulder is usually provided; injections into other areas of the body won’t help shoulder pain as much. The injection is not a long-term cure, but it can decrease pain, provide comfort at night to allow sleep, and allow the Rotator Cuff strengthening exercises to be performed without discomfort. Pain relief from an injection lasts an average of three months, although injections don’t help some people at all and others swear the injection cured them. As for other conditions, multiple injections into the same area can lead to tissue weakness and damage, and is discouraged. A full course of specific strengthening exercises should usually be undertaken prior to considering surgery. In the absence of a full-thickness Rotator Cuff Tear, surgery should be reserved for failure of non-operative management. If three months of strengthening and an injection don’t lead to a decrease in pain, then the choice is to: 1) Accept the problem and live with it, 2) Continue strengthening, although if strengthening exercises haven’t helped after 2-3 months the odds are low that they will help in the future, 3) Undergo surgery. There are a lot of misconceptions about the Rotator Cuff and its treatment. Many surgeons were taught that the Rotator Cuff gets injured because the bone above it, the acromion, has a hook or a bone spur that ‘impinges’ against it when the shoulder is raised. This has led to the term ‘Impingement Syndrome’ being commonly used to describe Rotator Cuff pain. Because of this, the most common shoulder surgery currently performed is the ‘Subacromial Decompression’ or ‘Acromioplasty’, where bone from the acromion is removed to relieve this alleged impingement. However, essentially all of the evidence gathered over the past 15-20 years states that the theory of ‘Impingement’ is simply not true. As previously noted, it is now known that Rotator Cuff pain is caused by degeneration of the Rotator Cuff tendon, i.e. tendinosis. In the vast majority of cases, the “impingement” of the Rotator Cuff against the undersurface of the acromion (bone) is the result of Rotator Cuff dysfunction, not the cause. 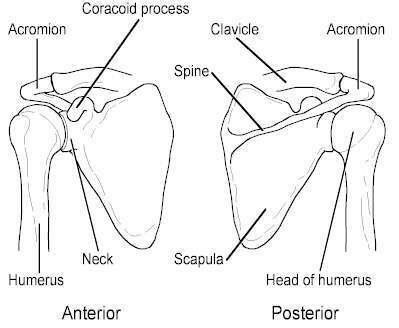 Any ‘hook’ or ‘bone spur’ present has been formed within a very important structure, the CA (Coraco-Acromial) ligament. The undersurface of the acromion and the CA ligament are, in the vast majority of individuals, normal structures designed to act as a ‘back-up system’ to help elevate the shoulder after the Rotator Cuff naturally weakens and degenerates with age. Many MRI and cadaveric studies have shown that this ‘hook’ or ‘bone spur’ does not cause problems in the vast majority of patients. And not only is this ‘bone spur’ removal often unnecessary, it often causes additional pain and stiffness, and potentially compromise future shoulder function. In fact, surgically removing the CA ligament, the structure that the hook forms inside of, can sometimes lead to permanently losing the ability to elevate the shoulder. It is usually preferable to leave the acromion bone intact. In addition, removing part of the acromion and the CA ligament (as done during a Subacromial Decompression or Acromioplasty) does nothing to remove the degenerative Rotator Cuff Tendinosis, which is usually the primary source of pain. The simple truth is that the arthroscopic subacromial decompression, which removes the ‘bone spur’ or ‘hook’, does not work that well. Many times appropriate strengthening exercises are not tried before surgery, so that ‘bone spur’ or ‘hook’ removal is often performed in cases where simple strengthening without any surgery would have cured the problem. After the surgery, a Rotator Cuff strengthening program is then used and the patient eventually feels better. But was it the surgery or the therapy that helped? Good question: Dr. Kirkley conducted an excellent research study where she made sure that all of her patients had appropriate Rotator Cuff strengthening performed before surgery and then operated only on those patients who didn’t get better from the strengthening. The results? Only 47% of patients (less than half) got better following Subacromial Decompression (aka. Acromioplasty).1 A more recent study by Dr. Ketola showed that patients that had the subacromial decompression surgery plus strengthening did no better than those patients who had strengthening alone without surgery.2 So why have a surgery done to your shoulder that adds nothing (except the potential for complications) to the cure rate of simple Rotator Cuff and shoulder blade muscle strengthening alone? But if Subacromial Decompression / Acromioplasty don’t work any better than Rotator Cuff and shoulder blade muscle strengthening alone, what surgery does? There is another arthroscopic procedure that simply removes the Rotator Cuff Tendinosis, the primary problem, without any of the ‘collateral damage’ of an arthroscopic subacromial decompression. This newer procedure is called Arthroscopic Rotator Cuff Debridement (ARCD) and is extremely effective. ARCD involves simply removing the unhealthy rotator cuff tissue, while leaving the normal structures alone. The acromion bone, ‘hook’ or ‘bone spur’ are not removed, unless there is a visible abnormality. In two original research studies that I published.3,4 ARCD led to excellent or good results in 79- 87% of patients that had already failed 3-6 months of Rotator Cuff and shoulder blade muscle strengthening. The complication rate was extremely low, and no patient was made worse. This is in contrast to the subacromial decompression, where permanent pain, stiffness, and even permanent loss of shoulder elevation may occur. 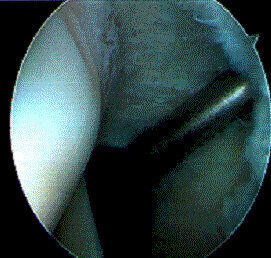 Arthroscopic Rotator Cuff Debridement (ARCD) minimizes post-operative pain and complications. 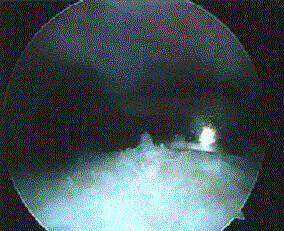 If a Rotator Cuff Tear is present, it is repaired arthroscopically. If the shoulder is unstable, it is stabilized arthroscopically. 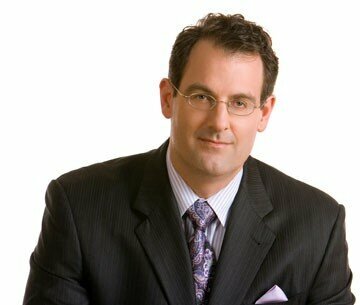 There are no formal activity restrictions following ARCD, as long as no other shoulder procedures are performed. Keep the arthroscopy portals (stab wounds) clean and dry for 24 hours. Before 24 hours, bathing is fine; just keep the shoulder above water and don’t get the dressings wet. After 24 hours, the wounds can get wet in the shower, then blot them dry. Don’t submerge the wounds under water until the stitches are removed, which usually happens at the first post-operative visit 2 weeks after the surgery. The elbow, wrist, forearm and hand can all be moved early on, to prevent stiffness. During Shoulder Arthroscopy, fluid is placed into the shoulder. This fluid will leak out over the first 2-3 days, and is not blood. After 2-3 days, the shoulder can be gently moved within the limits of pain. The same Rotator Cuff and shoulder blade muscle strengthening program used before surgery is usually restarted at roughly 2 weeks after surgery. Most patients with pain from Rotator cuff Degeneration / Tendinosis, also (incorrectly) called ‘tendinitis’, ‘bursitis’ or ‘impingement syndrome’, can be cured with a simple, specific Rotator Cuff and shoulder blade muscle strengthening program, without surgery. For those that don’t get better from exercises and an injection, ARCD is an extremely effective arthroscopic outpatient surgery, with a low complication rate. Following ARCD, the vast majority of patients obtain significant, if not total, pain relief and resume their work and play activities. 1) Kirkley A, Litchfield RB, Jackowski DM, Lo IK: The use of the impingement test as a predictor of outcome following subacromial decompression for rotator cuff tendinosis. 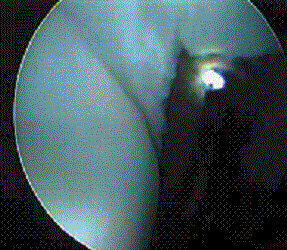 Arthroscopy 18:8-15, 2002. 2) Ketola, S., J. Lehtinen, et al: Does arthroscopic acromioplasty provide any additional value in the treatment of shoulder impingement syndrome? : a two-year randomised controlled trial. J Bone Joint Surg Br 91: 1326-34, 2009. 3) Budoff JE, Nirschl RP, Guidi EJ: Debridement of Partial-Thickness Tears of the Rotator Cuff Without Acromioplasty: Long-Term Follow-up and Review of the Literature. J Bone Joint Surg 80A:733-748, 1998. 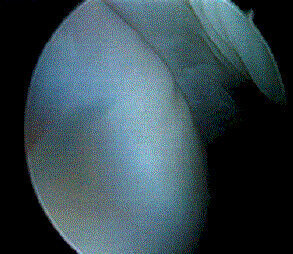 Arthroscopic Rotator Cuff Debridement. This Rotator Cuff May Initially Appear Normal. However, Despite What Many Surgeons May Think, This is Not the Rotator Cuff that is Being Viewed. The Rotator Cuff and its Tendinosis is ‘Hidden’ behind the Shoulder’s Joint Capsule, the Normal ‘Balloon’ of Tissue that Surrounds the Shoulder Joint. To See the Rotator Cuff and its Tendinosis, the Joint Capsule Needs to Be Removed with a Motorized Shaver. 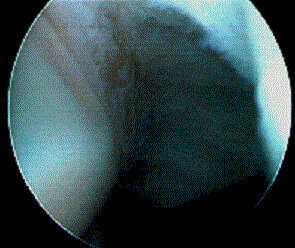 A Well-Debrided Rotator Cuff, with its Tendinosis Removed. 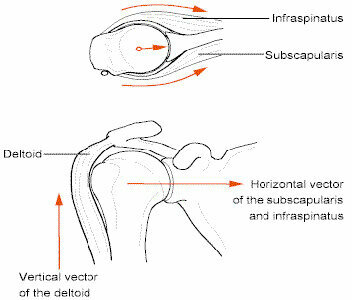 The Other Side of the Rotator Cuff, the Side That is Closer to the Acromion, is Being Viewed. Notice That Motorized Debridement Reveals Minimal Damage on this Side. This is Because, in >95% of Cases, the Rotator Cuff Damage is on the Inside, Away from the Acromion and any Bone Spurs.